Official spare parts distributor for many notebook manufacturers, for example Acer, Asus, Fujitsu, Toshiba, Dell and many more. When do I have to exchange the display cover? 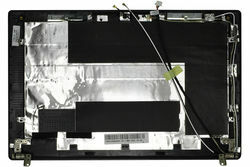 The hinge threads on the display cover are repeatedly exposed to strong pressure due to the laptop being constantly opened and closed. After some time they can break completely. Since cables run through these threads, the display cover should be replaced at the first sign of a defect. This prevents larger damage later on. The display lid can also tear due to a fall or other mechanical influences. Which is the suitable display cover for my device? You can find the right display lid via the manufacturer/model navigation. To do this, first enter your laptop model in the blue box in the upper left corner. After you have selected all other applicable filters, all compatible display covers will be displayed. This video serves as a step-by-step guide for replacing the display cover of your notebook. The conversion requires little technical knowledge. In order to exchange your display lid at home yourself, you only need a few basic technical skills. On our Youtube channel you will also find a step-by-step guide for replacing the display lid. Of course you can also send us your defective laptop. This is not much more expensive than buying the display lid like this. In addition, you can be absolutely sure that your laptop will function perfectly afterwards.